Happy weekend everybody! Yes, I know it's Tuesday, but today my weekend starts. Worked this passed weekend and yesterday, and from Thursday to Sunday it's time to work again. So today, let's get some scrapping, Fauxbonichipages and blogging done! But it is Tuesday and that meens I'm going to share something from my chaotic room. Don't have alot of stamps or incpads or embossing stuff but what I have, I do have in some sort of spread out organisation. 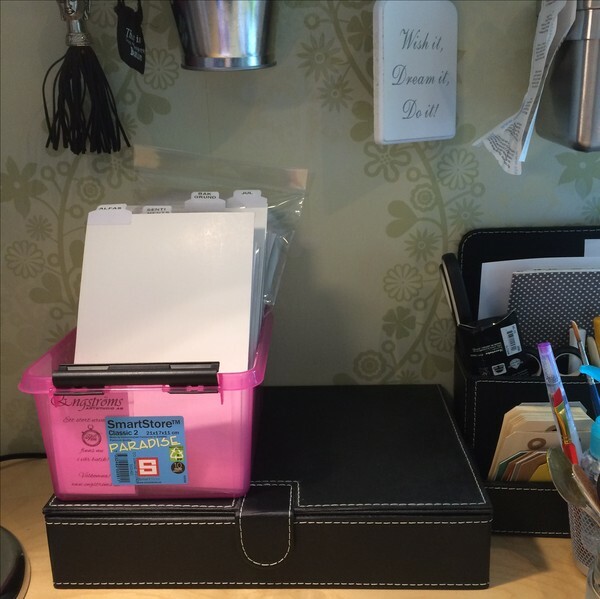 In this tower made of two Micke drawerunits from IKEA i have one drawer with my incpads. Micke in the bottom has his weels on, but the other one I just put on top of it. How about my big stash? Well, it's growing and growing and has done so for almost ten years. Yes, it's a slow grower. Maybe needs to be furtilized? Most of the incs has gotten in my possess this last year. And they are so fun! All you can do with them! 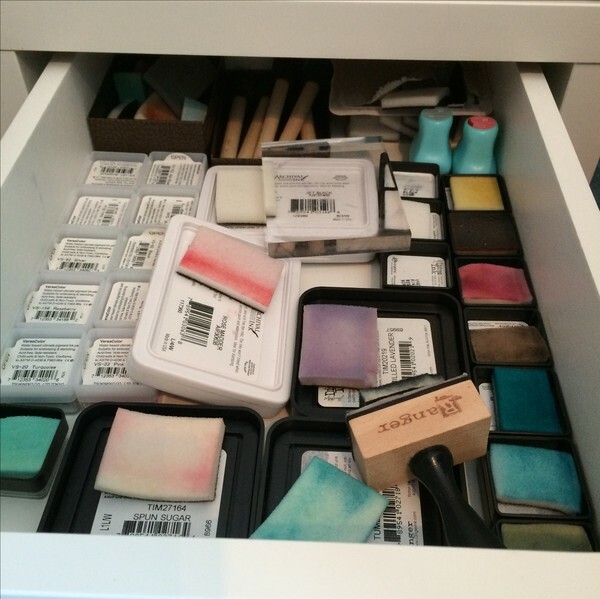 I mostly use them for the packagíng tecnique but you can see on the inc blending pads; they are used too. 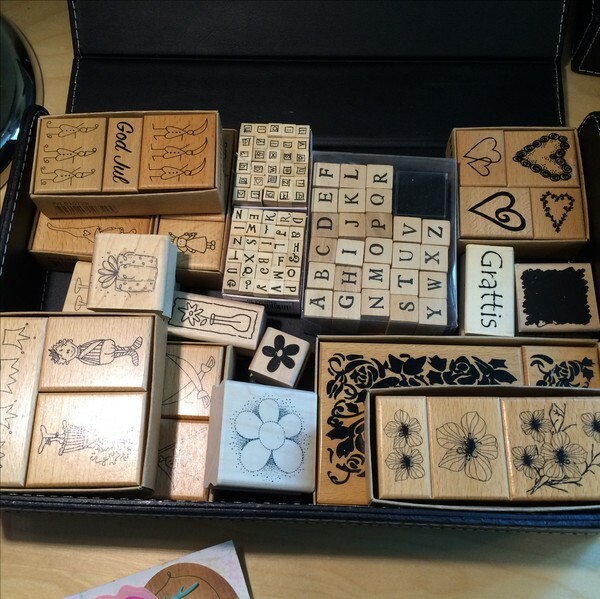 My clearstamps i store in a plastic box from Hammarplast.I put the different stampsets in Avery Elle Stamp and Die storage pockets. I cut ugly white papers and put in behind each stampset. 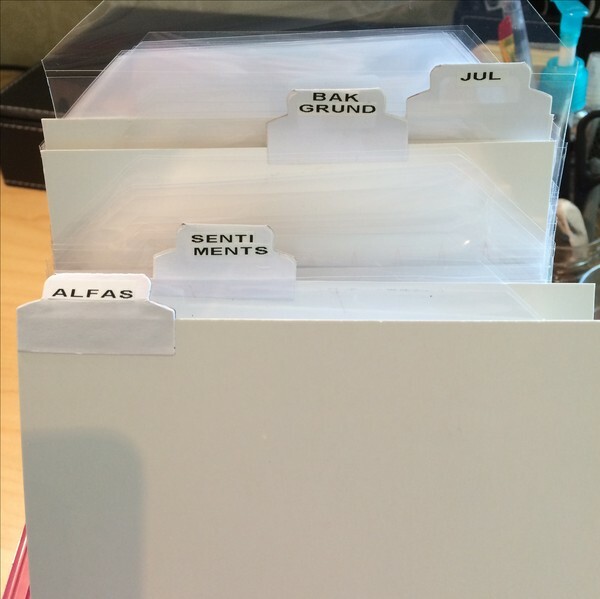 I made my own dividers and diecut out tabs with Tim Holtzs "Tiny tabs and Tags"-dies. Since I don't have so many stamps the categorys are Alfas, Sentiments, Backgrounds and Christmas so far. Behind the stamps I have my extra Avery Elle pockets. I love these! I use them for my dies to. 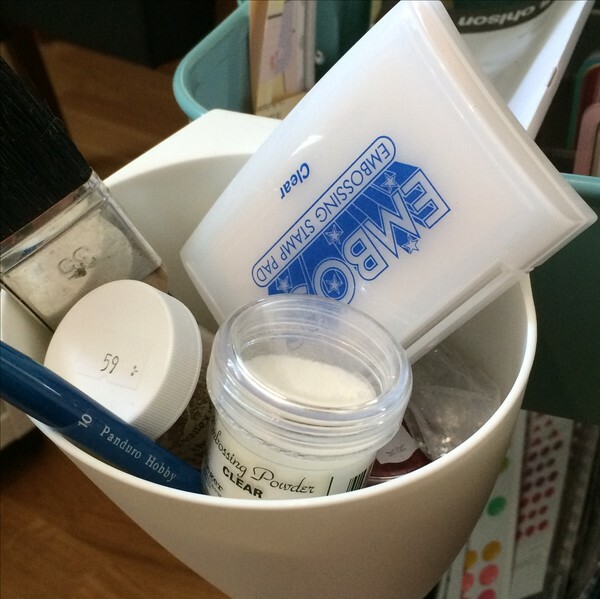 The idea for this storage I of cause got from searching Pinterest and YouTube. Under my bow with stamps I have an IKEA Rissla box in which I'm keeping my wooden stamps. They're mostly from Panduro which is a Swedish hobby store. This store was the first Craft/hobby store I heard of and it started off like a mail order Company (to me). When the store opened in my town it was huge to me. But now... I mostly find it expensive and that they don't have these funny brands like Heidi Swapp, Lawn Fawn, Crate Paper, Amy Tangerine, I guess you understand. But they do have a few Sn@p-items. I so wish that we had these kind of stores they seem to have in the US where you can find all sorts of brands and to a good price. There is one store i Gothenburg, or as we say, Göteborg, where there's a store called CiLi in Papers which I dream of going to someday. I've purchased once or twice from her webb shop and she has got gorgeous things and many of these famouse brands. Impressed? I'm not. But I don't use them that much. Yet. But I will... Made a layout earlier today where I used emboissing and package tecnique over it. Inspired by Adele, of cause. Turned out ok.
Scrapbooking, fotoalbum och gratulationskort och kanske lite mer.